Motorists are being warned to watch their speed as a new 20mph speed limit is rolled out in an Inverness neighbourhood. The new scheme will affect streets around the Merkinch area of the Highland capital. It is the latest in a region-wide initiative to increase the number of 20mph speed limits in the north. The proposal to drop the limit in Merkinch has been around for several years and preparation finally began last summer. Councillor Audrey Sinclair, chairwoman of Highland Council’s planning, development and infrastructure committee recently met pupils from Merkinch Primary School, local ward members and the council’s road safety team at Cameron Road to mark the completion and introduction of the new Merkinch Area 20mph scheme. She said: “This is the latest initiative in a Highland-wide 20mph speed limit programme which was approved by the council’s planning, development and infrastructure committee. “Our road safety unit continues to work towards achieving the road casualty reduction targets set out in Scotland’s road safety framework to 2020. Highland Council is also supporting the Scottish Government’s In Town, Slow Down campaign aimed at protecting vulnerable road users and reducing the number of pedestrian and cyclist casualties. 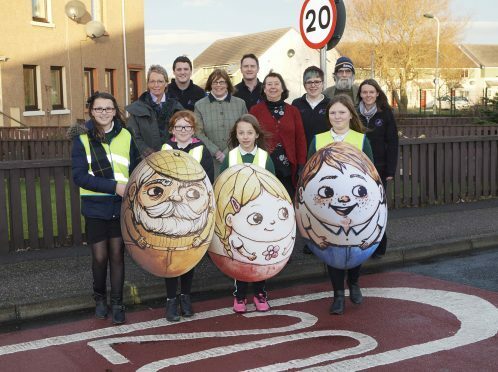 Junior road safety officers Kate Duncan-Hamilton, Shannon Creighton, Mjka Dulak and Charlotte Legg from Merkinch Primary demonstrated the vulnerability of pedestrians using model eggs as part of the government scheme. The council has previously said that further 20mph limits would be introduced in Nairn and Muir of Ord within the coming year. Some councillors have previously called for a city-wide 20mph limit to be introduced, rather than the current mix with 30mph sections.